Many children do not become members of the Catholic Church as infants for a variety of reason. However at some point in their young lives they or their parents may want them to learn more about their faith journey. The Rite of Christian Initiation for Children (RCIC) is provided for any child in grades 3 through 12, who is unbaptized or is baptized in another faith. This is a two year program that provides the foundation for the complete understanding of their faith journey and the Catholic Church. Year One provides a deeper understanding of their faith. Year Two provides the link between their faith and their future. 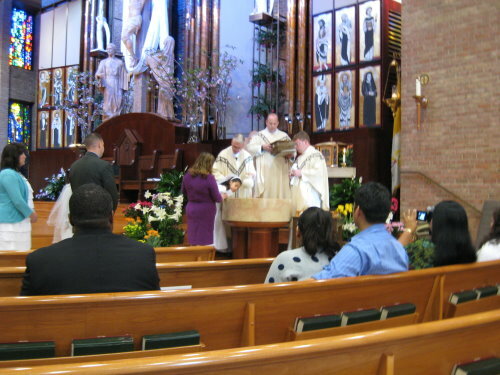 The entire program gives the individual an understanding of the Mass and the Catholic Church. At the end of Year Two, students receive the sacraments of Baptism (if unbaptized), Reconciliation, Eucharist, and Confirmation. Classes are held each week in the Parish Life Center. 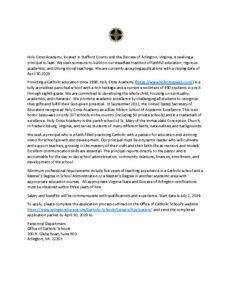 To register for classes, contact the Religious Education Office at 540-373-6491.